Sailing ships could return to our ocean, according to a concept for a new ‘sailing’ ship has been unveiled by Norwegian company Lade AS. 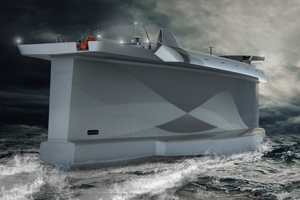 The hull of so-called ‘Vindskip’ is designed with abnormally high topsides to act as a vertical aerofoil to generate lift, providing extra propulsion to the ship by sailing. A gas and electric propulsion system will get the ship to speed and assist the wind-powered propulsion to maintain a constant speed, while a computer programme will calculate the best course for the ship to take for effective sailing, minimising the amount of fuel required for each voyage by up to 80 per cent. Whilst the concept is still at the wind-tunnel design stage, we could see ships tacking across the oceans again in the future.